Disparities in Bulimia Nervosa: Who is Left Behind? JOURNAL OF WOMEN’S HEALTH Volume 13, Number 6, 2004 © Mary Ann Liebert, Inc.
lacks the purging component), for example, has been reported in close to 80% of female college undergraduates. The ratio of female/male patients is in the range of 10:1–20:1. MEDICAL COMPLICATIONS OF BULIMIA TABLE 1. Binge eating (2 times/week for 3 months) Purging or other compensatory weight loss measures (2 times/week for 3 months) Regular self-induced vomiting or misuse of laxatives or diuretics in the purging type; other inappropriate compensatory behavior, such as fasting or excessive exercise, in the nonpurging type Self-image unduly influenced by body weight or shape Absence of anorexia nervosa aAmerican Psychiatric Association. Diagnostic and Statistical Manual of Mental Disorders, 4th ed. Washington, DC: APA, 1994. MEDICAL COMPLICATIONS There are three main modes of purging: selfinduced vomiting, abuse of laxatives, and misuse of diuretics. Most patients with bulimia induce vomiting with their finger, but some use ipecac. As the illness progresses, many can simply turn their heads and vomit reflexively without mechanical stimulation. The laxatives abused are the stimulant type containing bisacodyl, cascara, or senna. Diuretic preparations and diet pills, such as those containing ephedrine, are used less frequently. The medical complications of bulimia nervosa are related to the mode and frequency of purging, whereas in anorexia nervosa, they arise as a result of starvation (restricting) and weight loss (Table 2). MEHLER ET AL. TABLE 2. MEDICAL COMPLICATIONS OF BULIMIA TABLE 3.
normalized as well. Correcting the volume status improves the metabolic alkalosis and inactivates the renin-angiotensin axis, allowing successful potassium repletion. A good rule of thumb is that every decrease of 1 mmol/L in the serum potassium level represents a loss of 100–150 mmol in total body potassium. For repletion, oral potassium chloride is generally preferred. Typically, potassium is administered in a split dose of 40–80 mEq/day for a few days, with subsequent measurements of the potassium level to ensure normalization. Another manifestation of pseudo-Bartter’s syndrome is the development of lower extremity edema in those who purge excessively via vomiting, laxatives, or diuretics and then abruptly stop. The unopposed high levels of aldosterone, caused by the abrupt cessation of purging, can cause marked salt retention and edema. Attempts to self-treat this condition with diuretics will exacerbate the problem. Salt restriction, lower extremity elevation, and patience are usually all that is necessary to resolve this problem. Occasionally, it is prudent to prescribe a short, 2-week course of a potassium-sparing diuretic, such as spironolactone, to negate the effects of aldosterone and treat the edema, particularly when the distress over edema threatens a relapse in the patient’s bulimic behaviors. tive basis during self-induced vomiting. The low pH of gastric contents is below the critical threshold for enamel mineralization.22 Enamel erosion is usually seen after 6 months of self-induced vomiting and is ubiquitous in those who have had the disorder for 5 years.23 Erosion may cause thermal tooth hypersensitivity from dentin exposure. Unfortunately, once tooth enamel is eroded, it will not regenerate, and restorative dental procedures may be necessary. It remains controversial whether the mechanical abrasion from toothbrushing immediately after vomiting worsens this erosion, and several experts recommend mouthwashing with neutralizing solutions, such as sodium bicarbonate.22 Despite commonly bingeing with foods high in carbohydrate and fat content, patients with bulimia have lower rates of dental caries, plaque, and periodontal disease. This may be the result of compulsive oral hygiene practices in this population.24 Parotid gland enlargement (sialadenosis) is a particularly bothersome disorder seen in patients with bulimia. Enlargement occurs not immediately but after a patient has been in the bingepurge cycle for some time. Once enlargement occurs, however, it can reappear quickly when vomiting resumes. The prevalence of parotid enlargement is estimated to be between 10% and 50% in bulimic patients and occasionally involves swelling of the submandibular glands. Clinically, the swelling develops 3–6 days after a bingepurge episode has stopped, and its severity is thought to be related to the frequency of vomiting behavior. The swelling is usually painless but can be quite disfiguring and, therefore, emotionally disturbing to a patient who is already selfconscious about her physical appearance. Histologically, parotid gland enlargement is noninflammatory, but the glands exhibit an increase in acinar size and in the number of secretory granules. The mechanism of this enlargement is not entirely clear, but theories include: 1. Work hypertrophy, where repeated chewing and intake of carbohydrate-rich food hyperstimulate glands 2. Autonomic stimulation of salivary glands by pancreatic proteolytic enzymes brought into the mouth during emesis, which stimulate lingual taste receptors 3. Cholinergic stimulation of salivary glands by vomitus, increasing saliva production and secretion, which causes acinar hypertrophy Treatment of parotid gland enlargement begins with cessation of self-induced vomiting, heat applications, and the use of sialagogues, such as tart candy. For patients unresponsive to these measures, pilocarpine hydrochloride tablets (5 mg three times per day) may be useful.25 In unresponsive cases, parotidectomy is an option but may cause worsened cosmetic deformity and is rarely indicated. Erythema of the oral mucosa occurs as a consequence of chronic irritation from vomited gastric contents. Frequently, patients will complain of pharyngeal, palatal, and gingival soreness. Cheilosis is characterized by pallor, maceration, and in severe cases, painful fissures involving the angles of the mouth. Vitamin B12 deficiency should be excluded, and efforts should be made toward correction of the primary oral abnormality to maintain lip hygiene and prevent leakage of saliva through the corners of the mouth. a bulimic patient.30 Laxative withdrawal is best managed by anticipatory counseling, including setting the expectation that constipation and possibly rebound edema may occur but typically resolve within 10 days to 3 weeks. Patients should also be advised that regular exercise, adequate fluid intake, the addition of such bulk-forming agents as fiber or psyllium to the diet, and in some cases, an osmotic laxative, such as lactulose, will be necessary. Stool softeners are of little clinical value.31 Patients’ misconceptions about stimulant laxatives should be addressed. Moreover, they should be told that laxatives are an ineffective means of weight loss because their site of action is the large intestine, where they cause temporary fluid loss without concomitant caloric losses. Relapse to stimulant laxative abuse will worsen the dependency on them and increase the risk of more refractory constipation. Steatorrhea, protein-losing gastroenteropathy, and gastrointestinal bleeding have also been reported as a result of laxative abuse. Cardiovascular complications Cardiovascular complications occasionally result from the purging behaviors used by bulimics. Excessive purging of any type may cause volume depletion, which can cause dizziness, hypotension, or even syncope. Purging may also cause hypokalemia, which can lead to arrhythmias. The repeated use of ipecac to induce vomiting can cause an irreversible and potentially fatal cardiomyopathy. Ipecac is usually sold in bottles containing 30 ml of syrup of ipecac, the equivalent of 21 mg of emetine base, which is the toxic component. An estimated total dose of 1.25 g of emetine base may be fatal,32 and lesser doses may cause skeletal and cardiac muscle myopathy. The drug is excreted slowly, so accumulation over time is a major concern. Mitral valve prolapse may be more prevalent among bulimic women and usually resolves with weight gain. On occasion, these patients may complain of palpitations or even chest pain as a result thereof and, similarly, if ephedrine-type diet supplements are abused. SUMMARY Bulimia nervosa is an increasingly common disorder among young women, especially in industrialized countries. Not only can it have adverse physical effects, but it can also wreak havoc on the emotional and social lives of these patients. The physical signs of this disorder can be subtle and easily overlooked unless specifically sought. Likewise, normal laboratory abnormalities are unreliable for excluding the disorder. The art of medicine comes into play in the evaluation and treatment of persons with bulimia nervosa. Adopting an accepting rather than a judgmental attitude will aid the clinician in establishing trust with the patient, eliciting the historical details necessary to make the diagnosis, and offering the necessary medical treatment to negate the litany of medical complications that can occur with bulimia. REFERENCES 1. LaVia M, Kaye WH, Andersen A, et al. Anorexia nervosa: Criteria for levels of care. Eating Disorders Research Society Annual Meeting, Boston, 1998. 2. Garfinkel PE, Lin E, Goering P, et al. Should amenorrhea be necessary for the diagnosis of anorexia nervosa? Br J Psychiatry 1996;168:500. 3. Walters EE, Kendler KS. Anorexia nervosa and anorexic-like syndromes in a population based female twin sample. Am J Psychiatry 1995;152:64. 4. Garfinkel PE, Lin E, Goering P, et al. Bulimia nervosa in a Canadian community sample: Prevalence and comparison of subgroups. Am J Psychiatry 1995;152: 1052. 5. Kendler KS, MacLean C, Neale M, Kessler R, Heath A, Eaves L. The genetic epidemiology of bulimia nervosa. Am J Psychiatry 1991;148:1627. 6. Pyle R, Mitchell J, Eckert E. The incidence of bulimia in freshman college students. Int J Eat Disord 1988; 2:75. 7. Cotton MA, Ball C, Robinson P. Four simple questions to help screen for eating disorders. J Gen Intern Med 2003;18:53. 8. American Psychiatric Association. Diagnostic and statistical manual of mental disorders, 4th ed. Washington, DC: American Psychiatric Association, 1994. 9. Holderness C, Brooks-Gunn J, Warren M. Comorbidity of eating disorders and substance abuse: Review of the literature. Int J Eat Disord 1994;16:1. 10. Cooper PJ. Eating disorders and their relationship to mood and anxiety disorders. Brownell KD, Fairburn CG, eds. In: Eating disorders and obesity: A comprehensive handbook. New York: Guilford Press, 1995:159. 11. Edelstein CK, Yager J. Eating disorders and affective disorders. In: Yager J, Gwirtsman HE, Edelstein CK, eds. 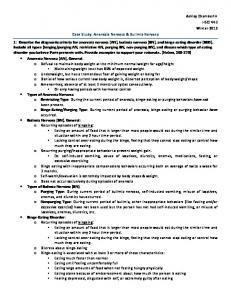 Special problems in managing eating disorders. Washington, DC: American Psychiatric Press, 1992:15. 12. Dansky BS, Brewerton TD, Kilpatrick DG, O’Neil PM. The national women’s study: Relationship of victimization and posttraumatic stress disorder to bulimia nervosa. Int J Eat Disord 1997;21:213. 13. Bulik CM, Sullivan PF, Cater FA, Joyce PR. Lifetime comorbidity of alcohol dependence in women with bulimia nervosa. Addict Behav 1997;22:437. 14. Weiner KL. In: Eating disorders: A guide to medical care and complications. Mehler PS, Andersen AE, eds. Baltimore, MD: Johns Hopkins University Press, 1999, pgs. 27–44. 15. Musisi S, Garfinkel P. Comparative dexamethasone suppression test measurements in bulimia, depression and normal controls. Can J Psychiatry 1985;30: 190. 16. Keel PK, Mitchell JE. Outcome in bulimia nervosa. Am J Psychiatry 1997;154:313. 17. Fairburn CG, Doll HA, Welch SL, Hay PS, Davis BA, O’Connor ME. Risk factors for binge eating disorders. Arch Gen Psychiatry 1998;55:425. 18. Mitchell JE, Hatsukami D, Eckert ED, Pyle RI. Characteristics of 275 patients with bulimia. Am J Psychiatry 1985;142:482. 19. Greenfeld D, Mickley D, Quinlan DM, Roloff P. Hypokalemia in outpatients with eating disorders. Am J Psychiatry 1995;152:60. 20. Mehler PS. Electrolyte disorders in bulimia. Eating disorders. J Prev Treat 1998;6:65. MEDICAL COMPLICATIONS OF BULIMIA 21. Mehler PS. In: Eating disorders: A guide to medical care and complications. Mehler PS, Andersen AE, eds. Baltimore, MD: Johns Hopkins University Press, 1999, pgs. 76–86. 22. Milosevic A, Brodie DA, Slade PD. Dental erosion, oral hygiene, and nutrition in eating disorders. Int J Eat Disord 1997;21:195. 23. Althshuler BD, Dechow PC, Waller DA, Hardy BW. An investigation of the oral pathologies occurring in bulimia nervosa. Int J Eat Disord 1990;9:191. 24. Milosevic A. Eating disorders and the dentist. Br Dent J 1999;186:109. 25. Mehler PS, Wallace JA. Sialadenosis in bulimia. A new treatment. Arch Otolaryngol Head Neck Surg 1993; 119:787. 26. Spechler SJ. Barrett’s esophagus. N Engl J Med 2002; 346:836. 27. Mendell DA, Logemann JA. Bulimia and swallowing: Cause for concern. Int J Eat Disord 2001;30:252. 28. Mitchell JE, Hatsukami D, Eckert ED, Pyle RI. Characteristics of 275 patients with bulimia. Am J Psychiatry 1985;142:482. 29. Camilleri M, Thompson G, Fleshman JW, Pemberton JH. Clinical management of intractable constipations. Ann Intern Med 1994;121:520. 30. Cotton P, Woodside DB, Kaplan AS. Laxative withdrawal in eating disorders. Treatment protocol and 3 to 20 month follow-up. Int J Eat Disord 1999;25:311. 31. Tramonte SM, Brand MB, Mulrow CD, Amato MG, O’Keefe ME, Ramirez G. The treatment of chronic constipation in adults. J Gen Intern Med 1997;12:15. 32. Ho PC, Diveik R, Cohen MC. Reversible cardiomyopathy associated with chronic ipecac. Clin Cardiol 1998;21:780. 33. Takii M, Uchigata Y, Nozaki T, et al. Classification of type 1 diabetic females with bulimia nervosa into subgroups according to purging behavior. Diabetes Care 2002;25:1571. 675 34. Rydall AC, Rodin GM, Olmsted MP, Devenyi RG, Daneman D. Disordered eating behavior and microvascular complications in young women with insulin-dependent diabetes mellitus. N Engl J Med 1997;336:1849. 35. Mehler PS. Diagnosis and care of patients with anorexia nervosa in primary care settings. Ann Intern Med 2001;134:1048. 36. Crow SJ, Thuras P, Keel PK, Mitchell JE. Long-term menstrual and reproductive function in patients with bulimia nervosa. Am J Psychiatry 2002;159:1048. 37. Conrad R, Schablewski J, Schilling G, Liedtke R. Worsening of symptoms of bulimia nervosa during pregnancy. Psychosomatics 2003;44:76. 38. Zipfel S, Seibel MJ, Lowee B, Beumont PJ, Kasperk C, Herzog W. Osteoporosis in eating disorders: A follow-up study of patients with anorexia and bulimia nervosa. J Clin Endocrinol Metab 2001;86:5227. 39. Gloria R, Allevato M, De Pablo A, et al. Prevalence of continuous manifestations in 200 patients with eating disorders. Int J Dermetol 2000;39:348. 40. Woodside DB. 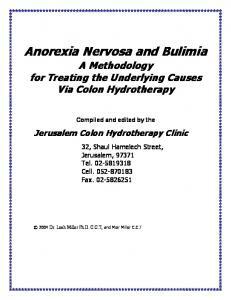 Inpatient treatment and medical management of anorexia nervosa and bulimia nervosa. In: Eating disorders and obesity: A comprehensive handbook, 2nd ed. Fairburn CG, Brownell KD, eds. New York: Guilford Press, 2002:335. Report "BULIMIA NERVOSA WAS FIRST IDENTIFIED as a distinct"